The Huế Academy of Music will celebrate its 10th birthday on November 25. The academy is one of three biggest music schools in Việt Nam, educating students from the central and Tây Nguyên (Central Highlands) provinces. It is the cradle of many talented musicians, music researchers, music critics and singers from the region and the nation. With its expanding size, growing quality and improving facilities, the Huế Academy of Music has proved its reputation and attracted more and more trainees and researchers all over the country. It has also promoted international exchange and cooperation. 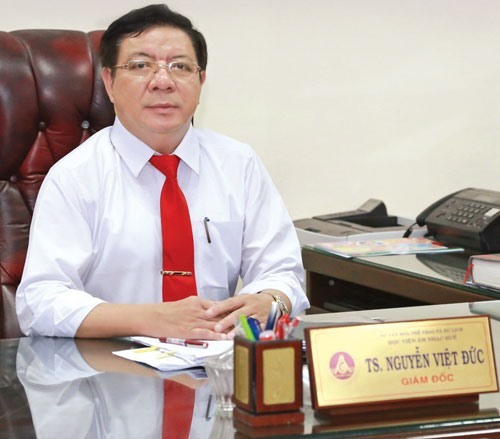 Composer Nguyễn Việt Đức, director of the academy, spoke about its 10-year development. Could you discuss the academy’s plans for future development? The Huế Academy of Music is one of three professional music schools in Việt Nam and the only one in the country’s centre and Tây Nguyên (Central Highlands) areas. These areas are poor and still face difficult conditions. But these localities’ musical traditions include three cultural intangible heritages recognised by UNESCO and two national heritages. UNESCO’s heritages include nhã nhạc cung đình (court music); Central Hightlands gong culture and ví dặm (dặm singing). The two national heritages are Huế singing and bài chòi singing. As a result, the academy is aiming to grow based on the foundation of these traditional music genres. We focus on developing skilled lecturers to meet the increasing demand for teaching. We also compile curricula based on regional and international advanced text books. We give priority to scientific research and international co-operation aiming to preserve and develop traditional music. We will try to standardise equipment and policies for students. How does the academy focus on training? The academy was established later than the two others in Hà Nội and HCM City. We are focusing on training not only students but also our pedagogues. Our pedagogues include four doctors; six postgraduates and 89 teachers with master’s degrees. Recently, we sent a teacher to the Academy of Music in Krakov in Poland to be trained as an assistant professor. Like almost art schools in the nation, the academy has also faced a lack of students. We not only welcome students from 15 central provinces and Central Highlands areas but we also co-ordinate to set up training centres in the provinces of Bắc Ninh and Bắc Giang in the north, and Bình Dương and Bình Phước in the south. To train students, we compile five curricula which enable them to gain knowledge of Vietnamese modern music, nhã nhạc and Huế culture. Fifteen our students received Toyota scholarships for young talents and five students got Kumho Asiana scholarships from 2016-17. Are the academy’s students given opportunities to perform? Huế City is a destination for domestic and foreign tourists. Art festivals and cultural events have been held in the city, giving our students opportunities to perform. We set up five ensembles to play regular weekend shows by the Hương River. The shows are among the city’s most impressive cultural activities for tourists. The academy also promotes performances and symposium discussions to popularise the academy among members of the public. We have held performances featuring our talented students and international artists. Recently, we invited the French band Travelling Jazz and German pianist Hinrich Alpers to perform in the city, and we organised a talk with American professor Eric Henry about the history of Vietnamese popular music and neighbouring countries. What has the academy achieved over the past ten years? The Ministry of Culture, Sports and Tourism has paid strong attention to the academy and given us favourable conditions to obtain more instruments. The academy has an institute for researching ethnic musicology and the only department of heritage music in the country. We invested in infrastructure construction with total capital of VNĐ148 billion (US$6,5million). We hope that the construction will make the academy not only a modern academy meeting the region’s music training demands but also another destination for tourists in Huế City. In addition to its multi-leveled training schemes from undergraduate to post-graduate levels as well as research activities, the academy also carries out concerts of different genres to serve the local people and tourists.